The English version of the website for Arab news channel al-Jazeera's is still experiencing problems following a series of hack attacks. The site has been the subject of several hack attacks since it went live last month. But the service is now stabilising and al-Jazeera does not expect farther disruption. "Fingers crossed that it is back up and running properly in the next few days," Newsroom coordinator Susie Sirri told BBC News Online. "We don't anticipate farther hacking as we have put in enough security barriers," she added. In the past week, the site has been the victim of several denial-of-service attacks, in which hackers flooded the servers with junk mail causing it to fall over. Visitors were also redirected to webpages with pro-US messages. The English-version and Arabic websites have proved extremely popular with people across the globe, keen to get another angle on the current conflict in Iraq. "It is presenting another side that isn't always provided on other networks," said Ms Sirri. There has been criticism in the West for al-Jazeera's decision to show pictures of dead and captured American soldiers. Its controversial reputation has guaranteed it headlines and made its website a popular destination for surfers. According to search engine AltaVista al-Jazeera has been the eighth most searched for term on the site since the Iraq war began. Other news websites, such as the BBC, CNN and Sky have also experienced a surge in traffic. "We expected a rise in war-related search terms but we were interested to see some more unexpected terms rising to the top," said Karl Gregory, Director of Marketing at AltaVista. "The eighth most popular search term currently is al-Jazeera signifying people branching out beyond their normal sources of news," he added. Al-Jazeera is also launching a service to provide news direct from the frontline to mobile handsets around the world. The text-based service will be available to 130 countries in Arabic and in English. Subscribers to the service will pay a monthly fee of $5.99. 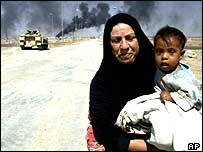 "The war with Iraq is taking place in a time when many feel detached and uninformed," said Samir Ibrahim, head of e-marketing at al-Jazeera. From the end of April, al-Jazeera plans to launch a full scale version of its website in English.